by Joanna Pope, whose twitter account you should totally follow. illustration by Claudia Pearson, whose Etsy store you should totally visit. I am, at the time of writing, five days away from my final English exams, which will be the last time I write a commentary on an unseen prose extract or poem, or respond to a question of comparing and contrasting two or three of the four plays studied. Ten days following this, my assessment will be complete and I will set foot in the Real World, which may or may not be dissimilar to the hard but well-worn pavement footpath leading off into the trans-suburban sunset that I tend to visualise. In addition to this image, I am also eager to test the validity of another characteristic of my pre-graduation perspective, involving what is arguably the existential dilemma of high school: ‘When am I ever going to use this in Real Life?’ Pubescent cynicism dictates that a large portion of stuff learnt will finally cease to be relevant and drop dead, this being a veritable definition of freedom. I have a sinking feeling that this may not be the case. Instead, a number of my behaviours bear the taint of my education, glaringly evidenced in the way that I sat down to read Issue #94 of Voiceworks. The pages of the ‘national, quarterly magazine that features exciting new writing by Australian young writers’ were promptly made damp with the ink of my annotations, ones that were not unlike those sported by the Seamus Heaney anthology issued by my English teacher. Paper 2 requires that ‘insightful and discerning connections’ be made in the analysis of a text through its comparison to others. 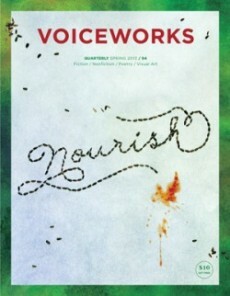 Given the rhizomatic nature and internal nourishment seen in this quarterly, what better way to contrast the works the voices of Voiceworks with, than each other? Also given the amount of material packed into each issue, spanning editorial, fiction, non-fiction, poetry and art, what better way to ensure that I don’t bite off way more nourishment than I could possibly chew, than to narrow my scope to an exploration of the fiction voices? With these two rhetorical questions answered, let’s begin, with the fiction piece that appears on page 9. The Fruit Bats is 23-year-old Fiona Line’s first published story, and was graced by a note under the title, illegible to all except myself, as I very clearly remember scrawling ‘AUthENTIC!!!! BEAUTIFUL!!!!!!!!!! !’ there. We are presented the perspective of a mother whose experience is convincingly and poignantly rendered in a first person narrative voice. A mimetic cohesion arises from the consistency of sentence structures, which are short, spare and often meditatively anaphoric, beginning with the first person pronoun. The observations made upon the appearances, behaviours and words of others are reserved, weighted with tactfully masked judgement and tired acceptance. We also gain fleeting insights into the voice that is continually aware of the lives of those around her, in the mentions of the small things that bring her pleasure, the things she decides to keep to herself, and sketches of her past. The economical expression that prevails throughout further serves to heighten the intensity of the few moments of confronting and powerfully visceral imagery that describes the electrocution of the titular bats: ‘Outside the crying swamps me. The air seems to waver at the same high frequency and the street is stretched out taut’; ‘The cry elongates like a shadow’; ‘I imagine what their wings must feel like, that thin membranous skin… I know their bones will be beautiful’. ‘Sebastian: We’re never going to have electricity again, are we? Sebastian: We can afford it. Me: It’s not an option. Such absurdity is exposed the final speech of Jesse, the son who had previously proven persistently quiet: ‘You’re all just so weird. Why do you never talk to each other properly? You never told the truth, you never discussed what you love and why you love it? The dysfunctional family is perhaps even more evocatively captured in Terrier, where the voice is, this time, that of the adult looking back to their own childhood. The writer, Matthew Sefton, 22, is interviewed in the ‘In Conversation’ section, where he reflects on the nature of the work as a resubmit, as well as the importance of tension and the unspoken within the piece: ‘The stripped-back, unreflective style of Terrier works because it mimics the way children think… They act on impulse and without interpretation… But the unspoken works on another more thematic level, in that it represents Richie and Jamie’s inability to take control of their lives. There is so much silence between them, not because they don’t know what to say, but because they don’t know how to say it’. Though the narrating figures of Blackout and The Fruit Bats could be considered the opposites of that in Terrier, these voices of parents reflect the communication difficulties described by Sefton just as much as their child narrator counterpart, with an atmosphere of foreboding that pervades all three stories. Ominousness manifests itself in Terrier in the growing sense of impending doom aided subtly through the use of present tense, culminating in a final image where we teeter on the threshold of something unknown, perhaps fate. Brothers Richie and narrator Jamie watch on as the small terrier, Max, that they met on their ‘… rickety blue dinghy, … (which swims) out into open waters, its nose pointing to the horizon, its eyes staring straight ahead. Always straight ahead. And for a moment it looked Max could make it. Then the waves rose up once more, and Max was gone.’ In both Terrier and The Fruit Bats, animals that pass transitorily in the lives of humans, serve to reflect a helplessness against the odds of unfamiliar environments. These moments take on their own significance within the context of the family unit, which is shown to be far more precarious than we idealise, and are ultimately vulnerable in the hands of fate. However, in Bronte, by 24-year-old Emily Prince, we see our protagonist escape the uncertainty of a dysfunctional family home in an act of self-determination. The use of the third person voice not provides an insight into the eponymous character with an intimacy equal to that achieved in the other pieces, while also allowing flexibility for more evocative imagery and descriptors, such as one of ‘the breath making webs of fog in her lips’. What is most remarkable about this particular voice is its matter-of-fact delivery of the discomfiting and veritably spooky, from Bronte’s desire from age 5 to ‘know what dying felt like’ that prompted her to leap off the roof of the house, to the casual coexistence of Bronte and the ghost of her Grandma Joan. This disarming tone gives way to a poignant exploration of Bronte’s coming-of-age, leaving home at 17 and experiencing her first underwhelming and unceremonious romantic encounters, with a mouth that was ‘wet like a snail’. Nevertheless, Bronte emerges as in charge of her own destiny in contrast with her family, whose home she returns to watch ‘come alive’ at dawn. The closing vignette is one of unchanging banality: ‘She watched as her father made breakfast and her brother did the dishes. Her mother sat at the kitchen table, reading’. Rather than a message of the all-submerging power of fate, Bronte confers the responsibility for our the nature of our lives onto the individual. This slightly shifted emphasis in the exploration of fate is also realised in a story whose voice is profoundly evocative of childhood in its deft use of the familiar rhythms of the fairytale: Avartum Avagartum, by Peter Dawcy, 24. Though Dawcy’s voice is just as musical as those of the Brothers Grimm and Hans Christian Anderson, Avartum Avagartum departs from the ordinary fairytale, firstly through the disappearance of flat character tropes in favour of a range of unique figures, each with their own motivations, fears and significance that reflects the good and evil that is not concentrated in different individuals, but coexist within us. The enchanting tale is, furthermore, without any kind of happy ending. As the ramifications of a conflict involving a talented goblin baker, his jealous rival, the village people and a young pickpocketing girl, escalate, so too does our somewhat desperation for a solution that rights all wrongs. At this point, the narrator’s voice shifts from lyrical observation to one of personal lament, indeed wishing he could present a satisfying conclusion to the tale. ‘But, alas’ – it would not be true. Instead, our eponymous goblin ‘…wandered far into the wilderness with his eyes downcast’ following a final event that formed a harrowing demonstration of the role of human selfishness as the deciding factor in the outcomes of lives. While on the surface linked quite explicitly to the theme of ‘Nourish’ in the central role of baked goods in Avartum Avagartum, the link between its bleak message and the uplifting connotations of ‘Nourish’ is a little more complex. The significance of the theme in relation to ultimate comments of The Fruit Bats, Blackout, Terrier and Bronte appears even more problematic, given their representations of family environments that fail to effectively meet the requirements of the nourishment and growth that are necessary for survival. Could it be that rather than celebrating the notion of nourishment, the voices of Voiceworks #94 are instead all subversion? Possibly. A relationship of nourishment as it is commonly understood is a basic, primitive exchange that has taken place since the unsophisticated beginnings of life in the form of prokaryotic cells. Times have changed, however, and today we are multicellular organisms with emergent properties (shout-out to my biology teacher), and the importance of nourishment has shifted too. We are largely able to take for granted, our ability to satisfy the lower tiers of Maslow’s Hierarchy of Needs. Increasingly, our focus is drawn to nourishing the more elusive desires of the higher echelons (love, belonging, esteem, self-actualisation). A number of structures and social units have been established so that we may meet these needs (read: wants). However, as demonstrated by the fiction voices of Voiceworks, we are faced with obstacles equally as insurmountable and perilous as a primordial beast in the path of a Neanderthal breakfast, but less tangible and more convoluted. Our ability to overcome such challenges and give sustenance to our ideals may be out of our hands, leaving us helpless against destiny’s tides, or it may in fact be a responsibility that we are capable of but choose to shirk from. Perhaps it is both. In any case, this is the complexity that besets our attempts to nourish today, and the fiction voices of Voiceworks do the unhappy but necessary job of demonstrating that it is so. And what of the relationship between the voices and their reader, and where the notion of nourishment lies in this respect? Again, the act of nourishment is shown to be less than simple. Rather than providing us with the cathartic happy endings to fill cookie-cutter holes in our metaphorical reading-stomachs, Voiceworks #94 provides us with a meal packed that is difficult to digest, not unlike one with extraordinarily high fibre content. The task of absorbing and assimilating all that lies between these covers is complex and challenging, leaving you with an uncomfortably full stomach for days. This, while a whole lot more trying than the primitive understanding of nourishment that we expect, is again far more necessary than short-term satisfaction. The fiction voices of Voiceworks coexist with their rhizomatic similarities and differences, to discuss and explore the way we coexist, with depth, authenticity and intimacy, so that we might develop a better understanding of the way we nourish ourselves and others in these trickier times. This is the last of Joanna’s posts as our Writer in Residence, but before you throw your hands in the air and scream ‘WHY? SHE WAS SO GREAT!’ you can follow her on Twitter to find out where she’s published next. WE HIGHLY RECOMMEND.